BAGHDAD -- An al Qaeda breakaway group's formal declaration of an Islamic caliphate across the stretch of territory it controls in Syria and Iraq sparked celebrations among the group's followers Monday but condemnation and even ridicule from its rivals and authorities in Baghdad and Damascus. The declaration was a bold move by the Islamic State of Iraq and Syria (ISIS), not just announcing their own state governed by Shariah law but also claiming legitimacy as a successor to the first Islamic rule created by the Prophet Muhammad in the Arabian Peninsula 14 centuries ago. In an audio recording Sunday evening, the group proclaimed its leader Abu Bakr al-Baghdadi as caliph and demanded all Muslims around the world pledge allegiance to him. Former CIA Director Michael Morell told "CBS This Morning" earlier this month that ISIS' first goal has been "to set up that caliphate and, it's not just in Iraq and in Syria." The announcement risks straining alliances with other Sunnis in Iraq that have helped the Islamic State achieve its blitz this month, seizing control of a large swath of the country's north and west. Those Sunnis, including former officers in the military of ousted dictator Saddam Hussein, have backed the Islamic State in hopes of bringing down Iraq's Shiite-led government but not necessarily its ambitions of carving out a transnational caliphate. Through brute force and meticulous planning, the Sunni extremist group - which said it was changing its name to just the Islamic State - has carved out a large chunk of territory that has effectively erased the border between Iraq and Syria and laid the foundations of its proto-state. Along the way, it has battled Syrian rebels, Kurdish militias and the Syrian and Iraqi militaries. Following the group's announcement, Islamic State fighters in their northern Syrian stronghold of Raqqa paraded through the city to celebrate. Some of the revelers wore traditional robes and waved the group's black flags in a central square, while others zoomed around in pick-up trucks against a thundering backdrop of celebratory gunfire. Video of the celebrations was posted online, and activists in the city confirmed the details. The Islamic State expelled rival rebel groups from Raqqa this spring, turning the city of some 500,000 along the banks of the Euphrates River into an image of the state it envisions. Activists from Raqqa have described life under the group's strict interpretation of Islamic law: music has been banned, Christians have to pay an Islamic tax for protection and people are executed in the main square. It is unclear whether the Islamic State's declaration heralds the imposition of the same rules elsewhere. So far, the group has taken a more moderate approach in cities under its control in Iraq, including the northern city of Mosul and the central city of Tikrit, choosing to overlook some practices it considers forbidden. But the extremist faction was also more lenient in towns in Syria before eventually tightening its hold. The announcement was greeted with condemnation and disdain elsewhere in Syria, including from rival Islamist rebel groups who have been fighting the Islamic State since January across northern and eastern Syria. "The gangs of al-Baghdadi are living in a fantasy world. They're delusional. They want to establish a state but they don't have the elements for it," said Abdel-Rahman al-Shami, a spokesman for the Army of Islam, an Islamist rebel group. "You cannot establish a state through looting, sabotage and bombing." In Iraq, where the government has launched a counteroffensive to try to claw back some of the territory lost to the Islamic State in recent weeks, the declaration is viewed through the prism of the country's rising sectarian tensions. The Islamic State has formed a loose alliance of sorts with other Sunni radicals in Iraq as well as former members of Saddam Hussein's Baath party, which has provided extra muscle to their assault. "Now the insurgents in Iraq have no excuse for working with ISIS if they were hoping to share power with ISIS," he said using one of several acronyms for the Islamic State. "The prospect of infighting in Iraq is increased for sure." It has seized upon widespread grievances among Iraq's Sunni minority and opposition to Prime Minister Nouri al-Maliki's Shiite-led government. Sunnis say they have been treated as second-class citizens and unfairly targeted by the security forces. The Sunni militant offensive has prompted Shiite militias to reconstitute themselves, deepening fears of a return to the sectarian bloodletting that pushed the country to the brink of civil war in 2006 and 2007. 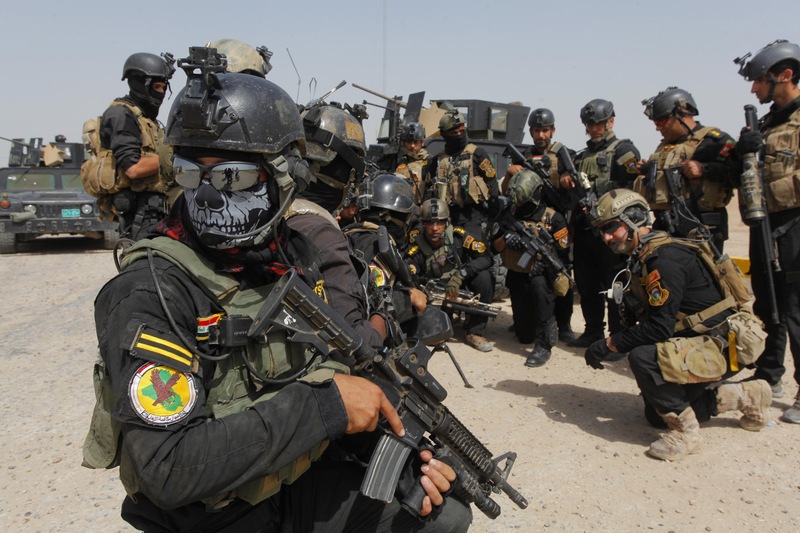 "This is what we have been saying that this origination is a terrorist one that should be fought, but regrettably, there are some people, the tribal revolutionaries, who are providing cover for it," Iraqi government spokesman Ali al-Moussawi said. "The world now bears a big and ethical responsibility to fight those terrorists who made Iraq and Syria their battlefield. We are fighting them not for the sake of Iraq only, but for the sake of the whole world."